This post is brought to you by Caitlin Wilson Textiles, high quality fabrics and pillows to brighten up any home. Enter SF15 at check out for 15% off! 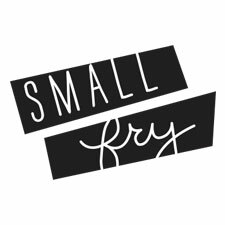 Whether you have a tight-knit neighborhood community, or are looking for ways to better get to know your neighbors, this simple idea is sure to be a hit! 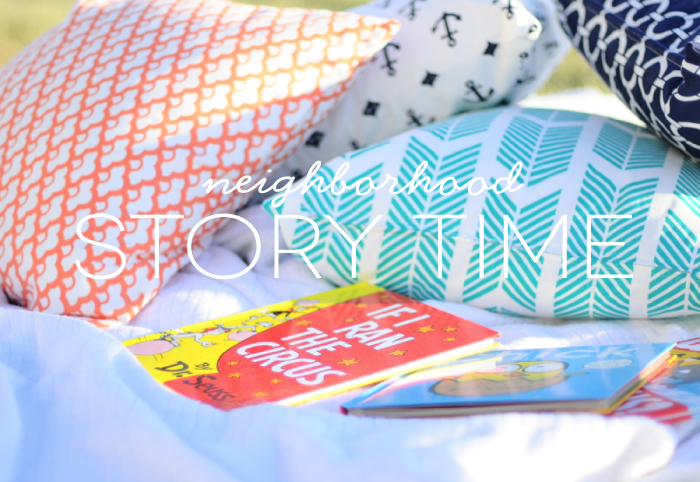 For this Neighborhood Storytime we simply sent out texts (fliers on doors would work well, too!) to neighbors to bring their favorite story to read to the group. 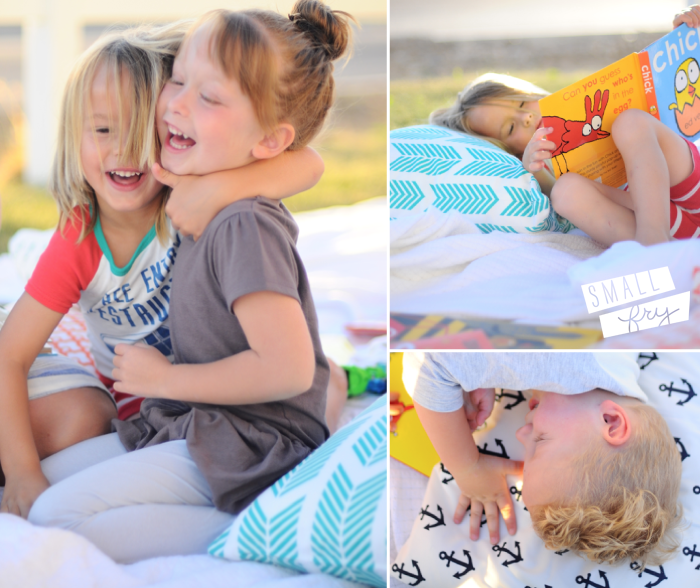 Right as the sun went down pajama’d kids piled on blankets and pillows and we each took turns reading our favorites. 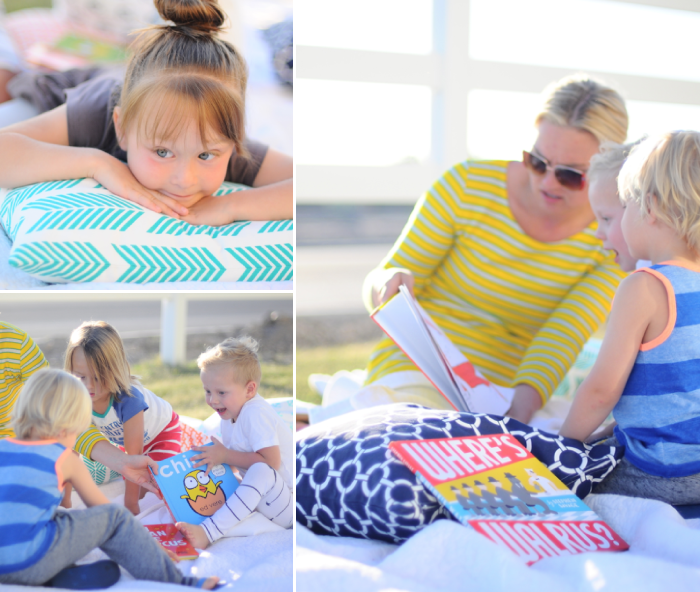 While parents took turns reading the other parents could easily mingle and there are always things to talk about when you’re watching your kids interact and get excited over your favorite books! We found it to be a great ice breaker and a simple way to get to know the parents of children our kids spend time with everyday. 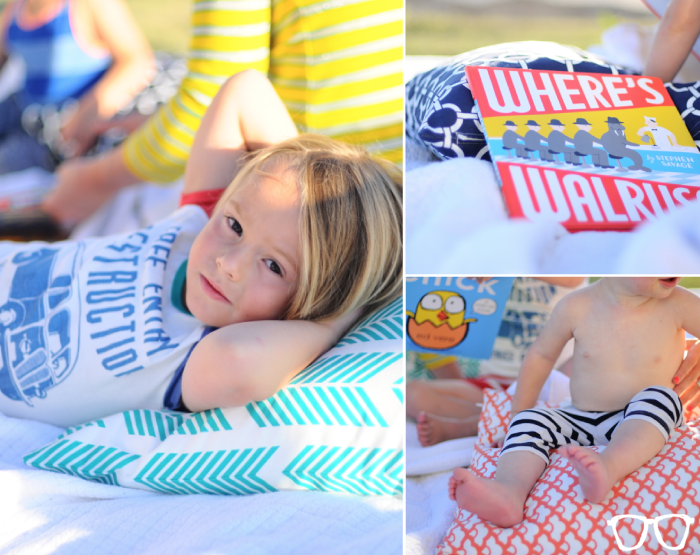 Luckily Caitlin Wilson Textiles sent over their favorites from interior designer and mom of two, Caitlin’s, new line of pillows so we could be extra comfortable, and they can’t help but make every angle a picture perfect photo op! 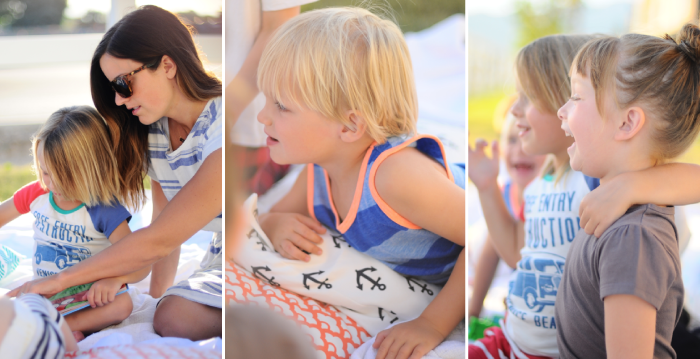 With anchors and arrows, lotus and links, sweet florals and bows all in perfect Summer brights there is sure to be a piece in CW Textiles for everyone! It was a perfectly low-key and sweet evening, and a tradition we’d love to start in our neighborhoods! Does your neighborhood do anything special to spend time together? We’ve been apart of over-the-top block parties where the streets close down for DJs and bounce houses on down to something simple like a costume parade before kids start their Halloween trick-or-treating. We’d love to hear what makes your neighborhood a great place to live! Caitlin Wilson Textiles has so graciously offered 15% off your purchase, just enter SF15 at checkout! LOVE this!!!! Thank you for posting and sharing with us!! I am totally inspired! !